The Centre Party is a liberal, Nordic agrarian political party in Sweden. Traditionally part of the Nordic agrarian family, the party has increasingly shifted its focus towards free market economics, environmental protection, gender equality and decentralisation of governmental authority. The party's major issues are national economy, environment and integration and it is represented in all of the Riksdags parliamentary committees. Högsjö is a parish in Ångermanland in Sweden. It contains Högsjö new church and Högsjö old church. In 1971 the parish became part of Härnösand Municipality. Ångermanland (help·info) is a historical province (landskap) in the northern part of Sweden. It is bordered by Swedish Lapland, Västerbotten, the Gulf of Bothnia, Medelpad and Jämtland. Prince Nicolas of Sweden is Duke of Ångermanland. Johannes Antonsson was a Swedish politician for the Centre Party. A member of the Riksdag from 1958 to 1979, he was interior minister from 1976 to 1978, and Governor of the province of Halland from 1979 to 1986. He also served as vice-chairman of the Centre Party from 1969 to 1979. Gunnar Hedlund was a Swedish politician. He was chairman of the Centre Party 1949-1971, Minister of the Interior 1951-1957 and member of the Riksdag (parliament) 1942-1976. The Moderate Party is a liberal-conservative political party in Sweden. The party generally supports tax cuts, the free market, civil liberties and economic liberalism. Internationally, it is a full member of the International Democrat Union and European People's Party. A coalition government is a cabinet of a parliamentary government in which multiple political parties cooperate, reducing the dominance of any one party within that "coalition". The usual reason for this arrangement is that no party on its own can achieve a majority in the parliament. A coalition government might also be created in a time of national difficulty or crisis to give a government the high degree of perceived political legitimacy or collective identity it desires while also playing a role in diminishing internal political strife. In such times, parties have formed all-party coalitions. If a coalition collapses, a confidence vote is held or a motion of no confidence is taken. Föreningsbanken was a rural and agriculturally-focused Swedish bank, with branches all over Sweden, which merged with Sparbanken in 1997 to create FöreningsSparbanken. Foreningen Norden, Föreningen Norden (Swedish), Norræna félagið (Icelandic), Norrøna Felagið (Faroese), Peqatigiiffik Nunat Avannarliit (Greenlandic) and Pohjola-Norden (Finnish), The Nordic Associations, sometimes referred to as The Norden Associations are non-governmental organisations in the Nordic countries promoting civil cooperation between the Nordic countries. Established since 1919, there are Nordic Associations in Sweden, Norway, Denmark, Finland, Iceland, Greenland, the Faroe Islands and Åland. Since 1965 these national branches are grouped in an umbrella organisation Foreningene Nordens Forbund (FNF), The Confederation of Nordic Associations. The co-operation between the Nordic countries include projects such as Nordjobb, Nordic Library Week and Norden at the Cinema. Televerket, was a Swedish State authority acting as a state-owned corporation, responsible for telecommunications in Sweden between 1853-1993. Originally it was named Kongl. Elektriska Telegraf-Werket, which was founded in 1853. Its name changed to Kongl. Telegrafverket in 1871, Kungl. 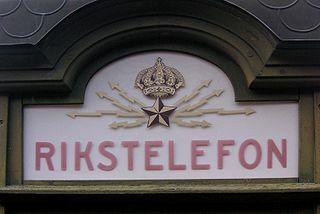 Telegrafverket in 1903, the prefix Kungl. was dropped in 1946 and the name was further modernised to Televerket in 1953. Televerket continued on with its telecommunications monopoly until corporatisation in 1992-1993 when it was renamed Telia, now part of Telia Company. Ulf Adelsohn is a Swedish politician, leader of the Moderate Party from 1981 to 1986 and Governor of Stockholm County from 1992 to 2001. He was a member of the Riksdag from 1982 to 1988 and served as Chairman of the Board of SJ AB 2001–2011, from where he resigned due to quarrels with the Reinfeldt cabinet on its railway deregulation policies. Stig Kjell Olof (Ola) Ullsten was a Swedish politician and diplomat who was Prime Minister of Sweden from 1978 to 1979 and leader of the Liberal People's Party from 1978 to 1983. He also served as Deputy Prime Minister briefly in 1978 and then again from 1980 to 1982 and served as Minister for Foreign Affairs from 1979 to 1982. This article gives an overview of liberalism and centrism in Sweden. It is limited to liberal and centrist parties with substantial support, mainly proved by having had a representation in parliament. The sign ⇒ denotes another party in that scheme. For inclusion in this scheme it isn't necessary so that parties labeled themselves as a liberal party. Karin Ann-Marie Söder was a Swedish Centre politician. She was the first woman in Sweden to be elected the leader of a major political party. She headed the Swedish Centre Party from 1985 to 1987. She was also one of the first female foreign ministers in the world. General elections were held in Sweden on 19 September 1976. Although the Swedish Social Democratic Party remained the largest party, winning 152 of the 349 seats in the Riksdag, a coalition government was formed with the Centre Party, the People's Party and the conservative Moderate Party, which formed Sweden's first non-socialist government since 1936. Centre Party leader Thorbjörn Fälldin, who had widely been expected to take over the government in the previous election of 1973, was appointed Prime Minister, the first not from the Swedish Social Democratic Party since Axel Pehrsson-Bramstorp's brief interregnum 40 years earlier. General elections were held in Sweden on 16 September 1979. Although the Swedish Social Democratic Party remained the largest party, winning 154 of the 349 seats in the Riksdag, the liberal interim government of Ola Ullsten was succeeded by another centre-right coalition government composed of the People's Party, the Moderate Party and the Centre Party, led by Centre Party leader Thorbjörn Fälldin. The three parties together won 175 seats, compared to the 174 won by the Social Democrats and Communists. It was the only time that non-socialist parties retained power in an election between 1928 and 2010. The Moderates dramatically increased their representation in the Riksdag, becoming the largest party of the non-socialist bloc, a position they have maintained ever since. General elections were held in Sweden on 19 September 1982. They saw the return of the Swedish Social Democratic Party to power after six years in opposition, the longest period in opposition by the Social Democrats since the 1910s. The center-right coalition of Thorbjörn Fälldin had earlier suffered a loss upon the breakup of the government in 1981, the year before the election, when the rightist Moderate Party chose to withdraw from the government, protesting against the centrist tax policies of the Fälldin government. After regaining power, socialist leader Olof Palme succeeded in being elected Prime Minister again, having earlier held power between 1969 and 1976. The Alliance, formerly the Alliance for Sweden, was a centre-right liberal conservative political alliance in Sweden. The Minister for Finance of Sweden, officially Cabinet Minister and Head of the Ministry of Finance, is a member of the Government of Sweden and is the head of the Ministry of Finance. This article describes the history of Sweden from the late 1960s until 1991. The third cabinet of Thorbjörn Fälldin was the cabinet and Government of Sweden from 22 May 1981 to 8 October 1982. The second cabinet of Thorbjörn Fälldin was the cabinet and Government of Sweden from 12 October 1979 to 22 May 1981. The first cabinet of Thorbjörn Fälldin was the cabinet and Government of Sweden from 8 October 1976 to 18 October 1978. 1 2 Marklund, Kari, ed. (1992). "Fälldin, Thorbjörn". Nationalencyklopedin (in Swedish). 7. Höganäs: Bra Böcker. ISBN 91-7133-426-2. ↑ Wilsford, David, ed. (1995). Political leaders of contemporary Western Europe: a biographical dictionary. Greenwood. pp. 132–39. 1 2 Uddling, Hans; Paabo, Katrin, eds. (1992). Vem är det: svensk biografisk handbok. 1993 [Who is it: Swedish biographical handbook. 1993] (in Swedish). Stockholm: Norstedt. pp. 362–363. ISBN 91-1-914072-X. ↑ Karmann, Jens (24 July 2016). "Thorbjörn Fälldin 1926–2016". Dagens Nyheter (in Swedish). Retrieved 24 July 2016. ↑ Pär Fjällström (10 December 2017). Fälldin, Statsministern som blev bonde (Video) (in Swedish). Stockholm: SVT. ↑ Svenning, Olle; T, Per (2014). Sveriges statsministrar under 100 år / Thorbjörn Fälldin (in Swedish). Albert Bonniers förlag. ISBN 9789100132453. LIBRIS 13496022. ↑ Svensson, Frida (24 July 2016). "Thorbjörn Fälldin har avlidit – blev 90 år". Svenska Dagbladet (in Swedish). Retrieved 24 July 2016. ↑ "Swedish ex-prime minister Thorbjorn Fälldin dead at 90". The Local . 24 July 2016. Retrieved 24 July 2016. ↑ Stattin, Gunnar (29 July 2016). "Planerna för Fälldins begravning tar form flera toppnamn närvarar". Örnsköldsviks Allehanda (in Swedish). Retrieved 2016-08-11. ↑ Wolodarski, Peter (30 October 2011). "När ryssen kom sade Fälldin: "Håll gränsen"". Dagens Nyheter (in Swedish). Retrieved 24 July 2016. (Subscription required (help)). Wikimedia Commons has media related to Thorbjörn Fälldin .